Fascinating sunset this evening. Looked to me as though the sun was falling through the sky. Gorgeous. Reminds me of all those poems about living brilliantly and going out in a blaze of fire rather than fading away--"To an Athlete Dying Young" and so on. Beautiful photograph, Amanda. Wonderful picture! I love taking pictures of clouds. 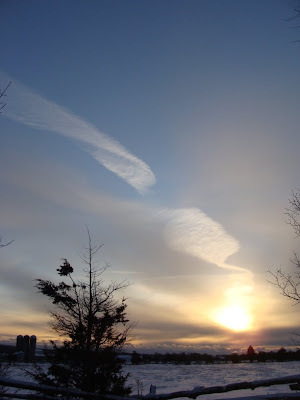 Have a google on the 'cloud appreciation society' there are some wonderful photos posted there! Nice photo, but those are chemtrails and not real clouds.